Camera: Canon EOS 300D (Canon Digital Rebel); Lens: Canon EF 100-400mm f/4.5-5.6L IS USM; Focal Length: 330mm; Aperture: f/8; Shutter Speed: 1/500; ISO: 400. Location: The jackal pair above was photographed at 7.27am during a morning game drive in Mashatu Game Reserve, Botswana. 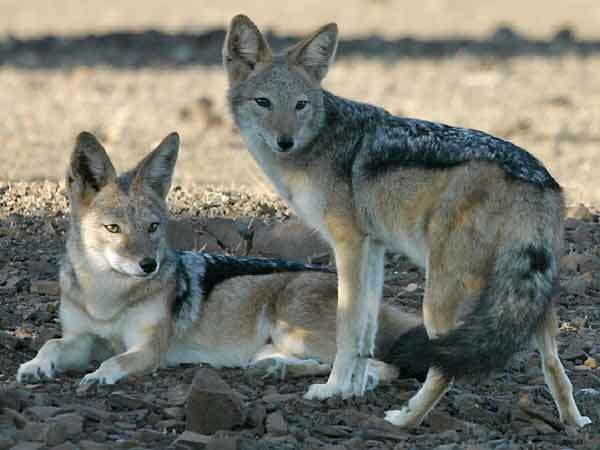 The sun was already sufficiently high for the jackals to prefer a shady spot in which to relax. Mashatu is a private wildlife reserve situated in the remote eastern corner of Botswana, an area known as the Tuli Block that borders Zimbabwe to the north and South Africa to the south. Although not as well-known as Botswana's Moremi Game Reserve and Chobe National Park, Mashatu boasts a mix of savannah, riverine forests, marshland, open plains and rocky outrops with plentiful wildlife. Large herds of elephant inhabit the area while predators such as lion, leopard, cheetah, and hyena are attracted by the wildebeest, kudu, eland, and impala also found there.